Standard Shipping($1.50): 8-15 business days after shipped; Expedited Shipping($40.99) : 4-7 business days after shipped; FBA or Expedited Shipping recommended. 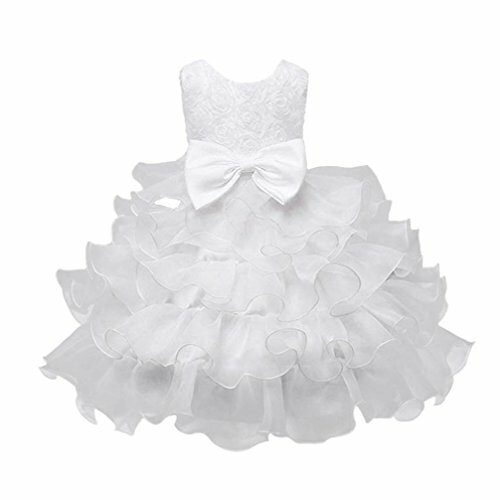 FEITONG is a professional large-scale online supplier of all kinds of baby clothing, kids clothes, toddler clothes. We are committed to providing the very best made clothing and accessories at the best prices. As a leading company in fashion business, we pioneer the best design to satisfy customer's lifestyle fashion. To ensure quality and size, please ensure you buy from Amazon or seller "" FEITONG "" and pay attention when you submit the order. FEITONG products that are sold by other sellers are imitation products similar in design. FEITONG does not support the quality assurance of these products. Hence, please check the name of seller before purchasing these products. Gender:Girls. Suitable for ages in children (0-10 Years old). Suitable for wedding party, holiday party, First Communion, ceremony, baptism, birthday, pageant, artistic photo shoot etc. Your sweet baby will be the most shining princess in the audience. You will gain a ton of praise!